Thank you to Wednesday Books for sending me copy of the book and for taking part of the tour. A girl who can speak to gods must save her people without destroying herself. A prince in danger must decide who to trust. A boy with a monstrous secret waits in the wings. Together, they must assassinate the king and stop the war. In a centuries-long war where beauty and brutality meet, their three paths entwine in a shadowy world of spilled blood and mysterious saints, where a forbidden romance threatens to tip the scales between dark and light. 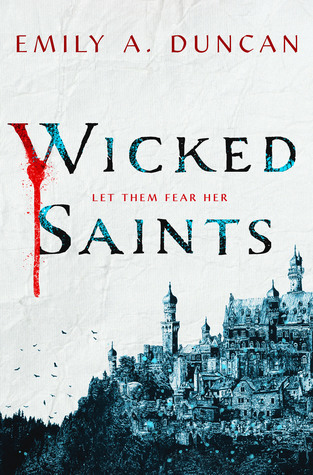 Wicked Saints is the thrilling start to Emily A. Duncan’s devastatingly Gothic Something Dark and Holy trilogy..
I’m not quite sure how to put my thoughts about this book out in words, it was that good. I mean it has Clerics, Blood Magic, Silent Gods and Countries at War. Wicked Saints is the first book in a new trilogy, told in dual POV. Nadezhda Lapteva (Nadya) a sheltered cleric that can communicate with the gods, when her home is under attack and this is when we first get to see the powers, she has access to. Seeing her home go up in flames Nadya is forced to escape with a friend in tow, in doing so she runs into a group of people that also want to see the King dead. On the other side is Serefin who is the prince Tranavia, he is a blood mage. He would rather spend his time out on the battlefield fighting the war instead of being used as a pawn by his father. Then there is the “dark bad boy” of the story, Malachiasz (Mal) who is a power blood mage, but he also has secrets and plans of his own. Even though there are the dual POV’s (Nadya and Serefin) Mal does play an important role in the story. I found how Nadya and Serefin’s abilities were used very interesting. Naday uses a rosary that has beads inscribed with runes for each god on them, this allows her to communicate with each one. Serefin has a book that can be used with his blood to send out spells. Since there are two different types of magic, there is also two different views of how the other one lives, and this is brought up a few times in the book, and there are some intense arguments as to which side is right and which one is wrong. It was hard to pick a side since both sides had valid points. This is a dark book, with some triggers that have been addressed by the author self-harm (both as a magic system, and talk of self-harm in the past), torture, parental abuse, abandonment, abduction, a lot of alcohol consumption (maybe addiction), gore, violence, and war themes. I am looking forward to the 2nd book in the series even thought I may have to wait a year for it. EMILY A. DUNCAN works as a youth services librarian. 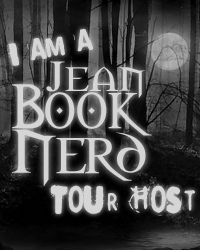 She received a Master’s degree in library science from Kent State University, which mostly taught her how to find obscure Slavic folklore texts through interlibrary loan systems. When not reading or writing, she enjoys playing copious amounts of video games and dungeons and dragons. Wicked Saints is her first book. She lives in Ohio. This sounds like an amazing book! Monarchies aren’t usually my cup of tea in books but maybe I will give this one a shot. Thanks for the great review!